Wow, I can't believe it is Wednesday again! Busy Busy! Well it was my week to set the challenge at Crafty Creations this week. So with the begining of spring what better than to do babies! We have a wonderful sponsor again this week! 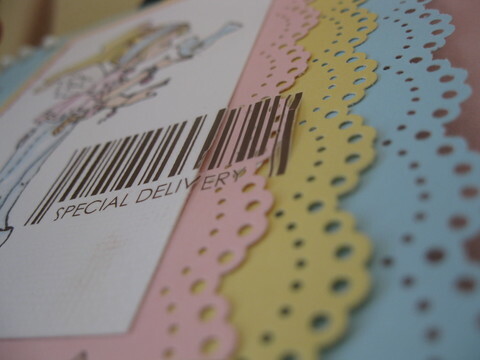 Kathrina from Whiff of Joy Stamps is offering up a yummy stamp for the winner this week! We are also holding a guest design team search. Check out the CCC Blog for details. My card this week features Melinda blowing Kisses from WoJ stamps. I masked the "kisses" and did a CTMH rub on bird instead. So it looks like she is kissing the little birdie. 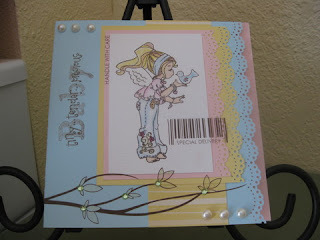 Papers are all CTMH and I used my new martha stewart punch for the border punch. Pearls are CTMH as are all the rub ons and word stamps. I colored Melinda with H2O pencils and flesh tone copic. Glittered with spicas. the little green bling was a gift from Shelly--thanks Miss Shelly! So pretty Jaime! Love the upc code sticker!! Great coloring and colors too!